The Pill Is Not Making You Gain Weight. Period. Earlier this year, a study found that the birth control pill doesn't make you fatter (in primates at least). Now yet another study has found that the pill doesn't lead to weight gain, despite what many women using the contraceptive report. Ingela Lindh, a student at the University of Gothenburg, Sweden, demonstrated in her thesis that it's a myth that the pill makes women pile on pounds. Lindh analyzed a study which asked 1,749 women questions about their health every five years from age 19 to 44, EurekAlert reports. She found that the subjects taking the pill didn't put on any more weight than those who didn't use it. According to the study, the combined pill, which contained estrogen and progesterone, is the preferred contraceptive among women younger than 29. After that, condoms are most popular, and from 32 on IUDs are most common. Lindh explains that women decide to stop using birth control pills for several reasons, "including a fear of side-effects, weight gain and mood swings, and these gradually increased over time and were more common in the youngest group." Subjects did gain about 23 pounds between ages 19 and 44, but the only factors that affected this were aging and smoking. "It's important to let women know that the pill doesn't affect their weight, as there's a real fear that they will put on weight, especially among young women, and this can be one of the reasons why they don't want to go on the pill." 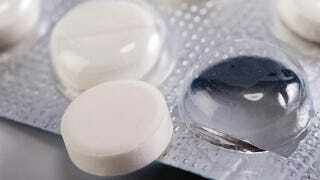 Scientists have said that women may be blaming the pill for natural weight gain that occurs with aging. Generally that may be true, but many women remain convinced that the pill caused some kind of weight fluctuation. Doctors have yet to declare that women are just making up their claims about mood swings, and for many women that's enough to make using the pill unbearable, with or without weight gain.